What’s the first weed you can remember eating as a child? For me it was sorrel or “sour grass” as we called it. I am speaking about oxalis or wood sorrel. Remember the one that looked like lime green clover with a little yellow flower that turned into something (now I know it was a seed pod) resembling a tiny green banana? It was puckery. But there is garden sorrel too, beloved by the French and originating in France’s southern highlands. It’s in the garden now and widely available year round at specialty markets. A relative of buckwheat and with broad leaves that remind one of spinach, but more lemony, sorrel’s acidic finish is due to its high oxalic acid content, the same as rhubarb. That makes sorrel a natural pairing with rich or fatty fishes and meats as a sauce. It also makes a nice purée or soup. In preparation, be sure to use a stainless knife or tear the leaves by hand. Sorrel will discolor a traditional French iron cooking knife as well as erode pots and pans, so use a stainless knife and enamel pot when cooking it. I like to use an array of spring greens in my spring greens and sorrel soup. 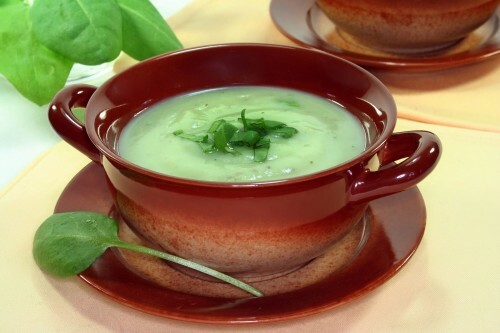 Try mixing fresh spinach, sorrel, and arugula with a handful of green garlic leaves for this energy boosting and easy soup. I am making this version a little bit leaner than a traditional French style sorrel soup. Sorrel is famous for turning an off-putting sludgy green color when cooked on its own. That’s why I like to mix in brighter greens like spinach for the soup. Much more appealing! 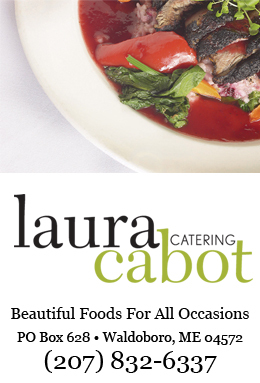 We are a full service catering company that specializes in finding the right balance between elegance... and pleasure.